For the turbine engine, see Rolls-Royce Turbomeca Adour. The Adour (Basque : Aturri, Occitan : Ador) is a river in southwestern France. It rises in High-Bigorre (Pyrenees), at the Col du Tourmalet, and flows into the Atlantic Ocean (Bay of Biscay) near Bayonne. It is 324 kilometres (201 mi) long, of which the uppermost 15 kilometres (9.3 mi) as the Adour du Tourmalet. At its final stretch, i.e. on its way through Bayonne and a short extent upstream, the river draws the borderline between the Northern Basque Country and Landes regions. Basque (; euskara[eus̺ˈkaɾa]) is a language spoken in the Basque Country, a region that straddles the westernmost Pyrenees in adjacent parts of northern Spain and southwestern France. Linguistically, Basque is unrelated to the other languages of Europe and is a language isolate to any other known living language. The Basques are indigenous to, and primarily inhabit, the Basque Country. 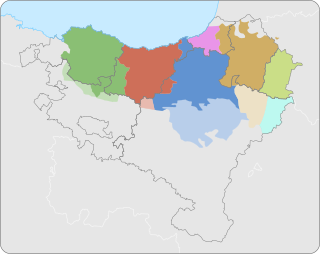 The Basque language is spoken by 28.4% (751,500) of Basques in all territories. Of these, 93.2% (700,300) are in the Spanish area of the Basque Country and the remaining 6.8% (51,200) are in the French portion. Hautes-Pyrénées is a department in southwestern France. It is part of the Occitanie region. Bagnères-de-Bigorre is a commune and subprefecture of the Hautes-Pyrénées Department in the Occitanie region of southwestern France. Tarbes is a commune in the Hautes-Pyrénées department in the Occitanie region of southwestern France. It is the capital of Bigorre. It has been a commune since 1790. It was known as Turba or Tarba in Roman times. Tarbes is part of the historical region of Gascony. a scow on the Adour in Bayonne in 1843 by Eugène de Malbos. The Échez, is a left tributary of the Adour, in the Hautes-Pyrénées, in the Southwest of France. The Arros, is a right tributary of the Adour, in the Southwest of France. The Léez, is a left tributary of the Adour, in the Southwest of France. Bayonne is a city and commune and one of the two sub-prefectures of the department of Pyrénées-Atlantiques, in the Nouvelle-Aquitaine region of south-western France. It is located at the confluence of the Nive and Adour rivers in the northern part of the cultural region of the Basque Country, as well as the southern part of Gascony where the Aquitaine basin joins the beginning of the Pre-Pyrenees. Col du Tourmalet is the highest paved mountain pass in the French Pyrenees, located in the department of Hautes-Pyrénées. Sainte-Marie-de-Campan is at the foot on the eastern side and the ski station La Mongie two-thirds of the way up. The village of Barèges lies on the western side, above the town of Luz-Saint-Sauveur. Labourd is a former French province and part of the present-day Pyrénées Atlantiques département. It is one of the traditional Basque provinces, and identified as one of the territorial component parts of the Basque Country by many, especially by the Basque nationalists. The Cantabrian Sea is the coastal sea of the Atlantic Ocean that washes the northern coast of Spain and the southwest side of the Atlantic coast of France; it represents the south area of the Bay of Biscay. It extends from the cape Estaca de Bares in the province of A Coruña, to the mouth of the Adour river, near the city of Bayonne on the coast of the department of Pyrenees Atlantiques in French Basque Country. Anglet is a French commune in the Pyrénées-Atlantiques department in the Nouvelle-Aquitaine region of southwestern France. Bardos is a commune in the former Basque province of Labourd in the Pyrénées-Atlantiques department in the Nouvelle-Aquitaine region of south-western France. La Bastide-Clairence is a commune in the Pyrénées-Atlantiques department in the Nouvelle-Aquitaine region of south-western France. Sames is a commune in the Pyrénées-Atlantiques department in southwestern France. It is generally considered part of the Basque Country province of Lower Navarre. Col d'Aspin is a mountain pass in the French Pyrenees in the department of the Hautes-Pyrénées. It connects Sainte-Marie-de-Campan, in the upper Adour valley, with Arreau, on the River Neste. The village of La Mongie is at 1,800 m (5,900 ft) altitude. There are also residences at 1850 and the Tourmalet building at 1900. It lies below the Col du Tourmalet 2,115 m (6,939 ft). It is in the canton of Campan in the Midi-Pyrénées region of France and around 20 kilometres (12 mi) from the Spanish border. La Mongie is a winter ski resort offering alpine skiing, snowboarding, snowpark, cross-country skiing, snowmobiles and hiking in snowshoes. In the summer cycling and the use of trials motorcycles is popular. The village has two small supermarkets, a tourist information centre, gift shops and many restaurants and ski rental shops. The nearby spa town of Bagneres de Bigorre offers large supermarkets and shops, restaurants, a casino, an 18-hole golf course and the natural spa baths themselves. Beaudéan is a commune in the Hautes-Pyrénées department in the Occitanie region of south-western France. Campan is a commune in the Hautes-Pyrénées department in the Occitanie region of south-western France. Maubourguet is a commune in the Hautes-Pyrénées department in south-western France, in the Occitanie region. Val-Louron is a ski resort in the French Pyrenees, in the department of Hautes-Pyrénées, and the region Midi-Pyrénées. The railway from Toulouse to Bayonne is an important French 319-kilometre long railway line, that connects the southern city Toulouse to the southwestern town Bayonne, running along the foothills of the Pyrenees. The railway was opened in several stages between 1861 and 1867. Wikimedia Commons has media related to Adour . Commission Européenne—Natura 2000: Cartographie du Barthes de l'Adour—(in French) — maps of the Adour and Adour Basin. Gouv.fr: Natura 2000 en France—(in French) — website homepage. Wikimedia Commons has media related to Adour Basin . This Nouvelle-Aquitaine geographical article is a stub. You can help Wikipedia by expanding it.